If you have the Discover More Credit Card you probably know that you can sign up for receiving 5% cashback in certain categories. From April through June you get 5% cashback in the Restaurants and Movies Categories. 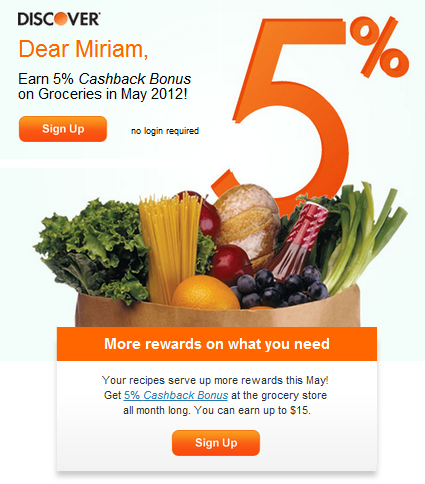 Besides from those categories, you can now sign up to receive 5% cashback on $300 in purchases for the entire month of May for Groceries. This will earn you $15 in cashback. You should receive a confirmation email after you have signed up. If you don't have a Discover More Credit Card, click here to sign up for this card and both of us will receive $50 cashback with your first purchase! This card has no annual fee.